Will The Internet of Things Make Our Lives Any Easier? The "Internet of Things" is shaping up to be the buzzphrase of the year as more and more of our machines take off their dunce caps. But as history has shown us, a smarter gadget doesn't necessarily mean an easier life. If our modern soothsayers can be believed, soon your refrigerator will be snapchatting your garbage disposal raunchy pics of your microwave, while your thermostat consults your lawnmower for stock picks. Or something like that. The "Internet of Things" is said to be the next evolutionary step in our connected world — the promise that every machine in your physical environment will be talking to each other and acting pseudo-intelligently without much in the way of human intervention. Of course, this techno-utopian dream was a promise of the future long before the web was even a twinkle in Tim Berners-Lee's eye. Movies like Electric Dreams (1984) showed a public that was just becoming acquainted with personal computers that these devices would soon be turning on coffee makers and providing security for our homes. Going back even further, the early '60s version of "The Jetsons" often poked fun at the postwar cliche that people wouldn't know what to do with themselves once the home computer took over life's more tedious tasks. Today our abundance of smartphones, computers, dishwashers and electric vacuum cleaners all supposedly leave more time for the 21st century human to lounge around and eat bonbons. Just push a button, and everything is automatic. But what if that's simply not true? What if technology of the 20th century didn't actually create more leisure time? What does that mean for the bright-eyed and bushy-tailed technophiles among us who are making sure that all of our gadgets can speak the same language? Just about every generation of the last hundred years has debated whether their new-fangled appliances and gadgets were indeed making life any easier. One of the most interestingly counterintuitive studies on the effects of technology on housework and leisure came from Joann Vanek in the mid-1970s. Vanek argued that the time American women devoted to housework hadn't actually declined from 1920-1970. She explained that with the rise of electric appliances like dishwashers and vacuum cleaners, housework had obviously become more efficient. The only catch? That the standard for what constitutes a clean house (or a clean person for that matter) had simply evolved along with the technology. 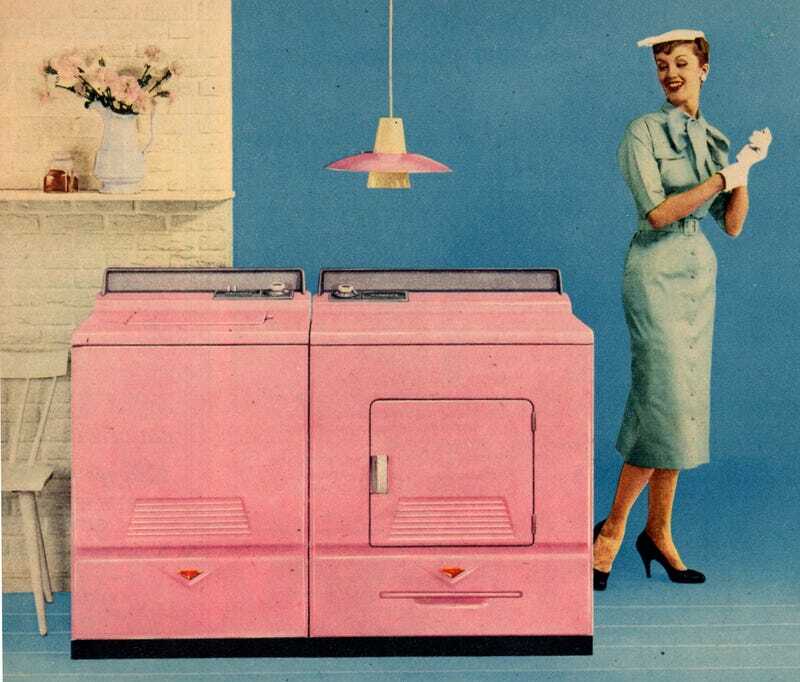 Doing the laundry in 1950 may have become much easier thanks to the rise of electric washing machines, but the societal expectations around how often one's clothes should be cleaned shifted dramatically since, say, 1900. Cleaning a floor was decidedly harder in 1910 than it was in 1960 but the relative ease of use for appliances like the electric vacuum cleaner changed American expectations about what constituted "clean." A woman doing her wash in 1910 might spend eight or nine hours of her week on the enterprise, and for her pains get eight or nine pounds of clean laundry (dry pounds, that is! ), but if her grandaughter [sic] with a Bendix (or its descendants) puts in the same number of hours (carrying, folding, sorting ironing), she and the members of her household will be able to change their underwear and outer clothing every single day, their sheets and towels every week — luxuries that in times past were permitted only to the rich (who employed laundresses). Reflecting on the efficiency-boosting capabilities of our machines in the 20th century leaves us with some difficult questions here in the 21st. Will the next step in the progressive march of our gadgets (specifically in the way that they talk with each other and the outside world) lead to more leisure time for us humans? Or will the Internet of Things™ simply create new, more demanding expectations of how our time is accounted for on any given day? This question seems even more pressing in an information and communications-driven society. Back in the 1950s, taking a family vacation to a place like Yellowstone meant that you'd be largely out of reach should something come up that demanded your attention at the office. Today, our national parks are considering an expansion of cellular service under pressure from both the big telecom companies and visitors who often see internet service as more essential than running water. So don't complain when the boss emails and says that your deadline for next month's report has suddenly become more urgent. There's no longer anywhere to hide. But in the future we may romanticize the simpler days of the early 21st century — before your toaster became besties with your toothbrush.